The Bastion Garden of Willibaldsburg Castle was laid out by the Bavarian Palace Department on the basis of the "Hortus Eystettensis", a collection of copperplate engravings published by Basilius Besler (1561-1629) in 1613, and was opened to the public in 1998. This informative garden, which shows the plant world documented in the historically important "Hortus Eystettensis", is probably unique in Germany. 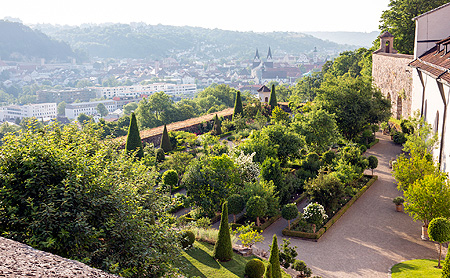 The flowers are planted according to their blooming seasons, as described in the book, and the complex is also a reminder of the famous botanical garden of Prince-Bishop Johann Conrad von Gemmingen, which was laid out by Besler from 1592. The access to the Bastion garden is difficult because of steep slopes.